On this page I have listed a few of the Excel files that I have made for homeschoolers. I have made a lot of excel files, but I don't like offering them online because I end up giving support on how to use the spreadsheet program. So please - look in excel's help files before contacting me if your question is related to using the program and not my files. Unintended Changes to File - My files are generally in working order when "shipped." However, adding rows, or columns can will alter the file in such a way that I can't help you if you ever need it. Dragging cells from one location to another or using "Cut" from a right-click menu can break the worksheet. I do not support adding rows, columns, cutting cells, or dragging cells. When you unprotect a sheet Be Aware that you can delete the formulas that make the file work! The whole point of using a spreadsheet program to keep track of grades is that the spreadsheet program can be made to calculate the grade averages. Click on the link to download and save to your computer. 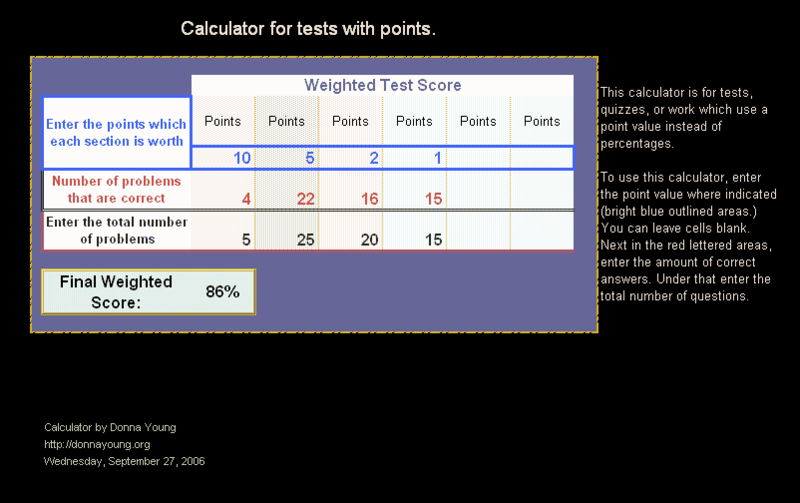 The grade calculator returns a percentage grade based on your input. The file supports both points and percentages and up to 7 weighed values. The Composition Grader - also called "Criteria Grader"
This file lives in the English section of donnayoung.org. Related to this file is Lab WU which is located in the Science section. I made this file for my use many years ago. I used it to arrive at a score and letter grade for certain types of work. With this file, you can evaluate work that has weighted parts within weighted parts. View a screen shot of the grader. The composition grader may be downloaded from The Composition Grader. In all there are 15 different G&A files. That's a lot. This page is designed to help you choose one.